Illiteracy, limited education, and corruption are just some of the systemic barriers women in India's informal sector face in accessing basic government and health services. 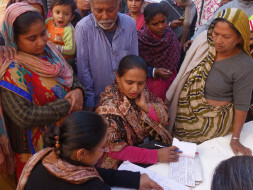 SEWA's community centers help tens of thousands of women overcome these obstacles to access food ration cards, general health checkups, and information about malnutrition. Today, these centers are in urgent need of funds to cover basic infrastructure and equipment costs. Please help us continue to serve one of India's most vulnerable populations. Government benefits like food ration cards and subsidized healthcare are designed to uplift the poorest and most vulnerable members of Indian society. However, these benefits often go unclaimed: corruption, lack of awareness, limited education, and other systemic barriers leave those most in need, least able to access help. Filling out government forms is complex enough for most of us, but the process can be impossible for those who cannot read, cannot afford to hire help, or simply do not know these benefits exist. And within these economically-disadvantaged groups, women are faced with a double disadvantage due to cultural, educational, and other barriers. To help these and their families overcome such obstacles, we opened eleven community centers (SEWA Shakti Kendras, or SSKs), in Delhi and Bihar. 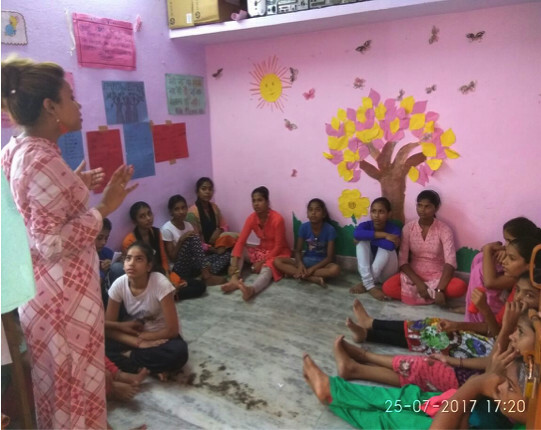 Located in the heart of the most disadvantaged areas of these states, these centers focus on helping poor women--especially those working in India's informal economy as domestic help, construction workers or other informal employment roles. 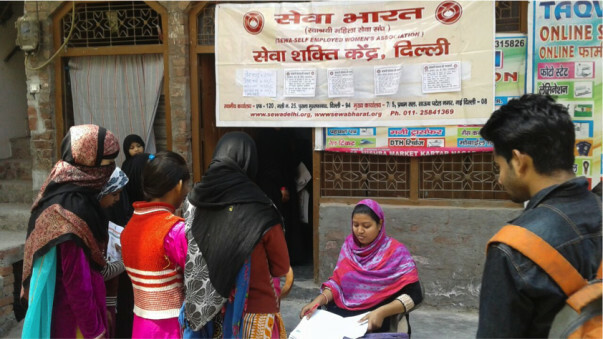 In 2017 alone, Delhi's seven SSKs served over 40,000 women, linked over 12,000 women to government services, and provided legal and health services to over 3,500 people. Over half of SSK beneficiaries have not been educated beyond the fifth standard or are entirely illiterate. To keep SSK services affordable for these communities, our staff has gone without basic equipment, supplies, and infrastructure—but the situation has become urgent. With your support we hope to continue this important work. With 2000 rupees ($31 USD), one SSK can run a health camp or a social security camp in its local community. Each health camp connects 80-100 women with needed health services like eye camps, cancer screenings, and general checkups. Each social security camp helps 90-120 women fill out applications for PAN cards, Aadhaar cards, and other basic ID documents which enable her to access government benefits. With 10,000 rupees ($154 USD), one SSK can cover its rent costs for a month, or can purchase a multifunction printer. 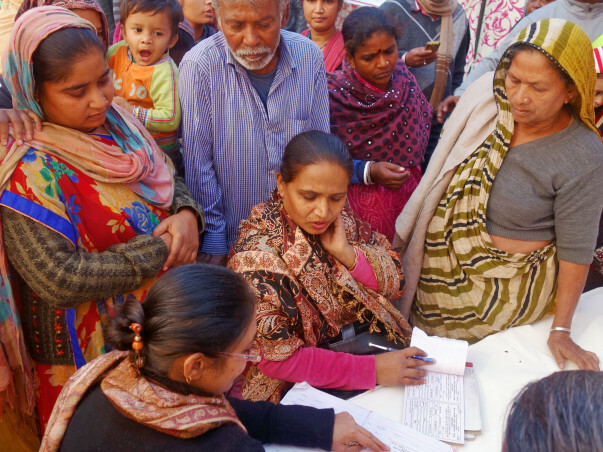 Currently, only one SSK in Delhi has a printer; the six others must ask women seeking application aid to take their orders to a nearby print shop. This significantly delays their applications, and in some cases doubles the amount they must pay to have their papers processed. With 20,000 rupees ($309 USD), we can become an authorized PAN authority, significantly reducing our PAN card processing costs. With 200,000 rupees ($3088 USD), we can become an authorized Aadhaar card authority, significantly reducing our Aadhaar card processing costs. With 220,000 rupees ($3393 USD), we can buy a computer for every SSK. With 588,000 rupees ($9068 USD), we can sustain the pay of Delhi’s amazing current SSK staff for the next year. Please support us in our effort to help some of India's most vulnerable access the government support they need and are entitled to. Any amount makes a difference. The Self-Employed Women’s Association (SEWA) works to empower poor women working in India’s informal economy by equipping them with both the personal confidence and practical tools necessary to fulfill their needs and exercise their rights. 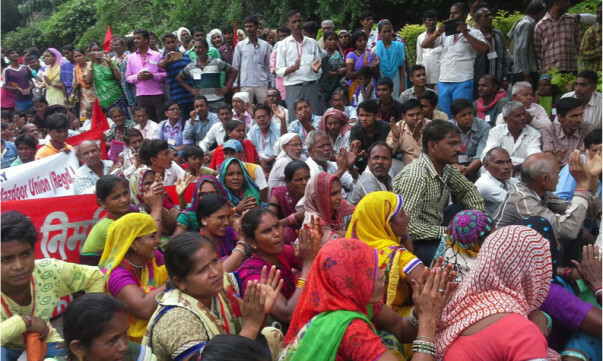 A grassroots organization and empowerment movement developed by women, for women, SEWA’s strength lies in its decades-long personal connections to some of India’s most vulnerable communities. Since its start alongside Gandhi’s Textile Labor Association in 1972, SEWA has spread across 14 states. It now includes 2 million active members, unified across cultural, geographic, and linguistic lines in pursuit of a vision of self-reliance, full employment, and fair treatment. For more information, please visit sewabharat.org. Your kindness helped us to raise Rs. 151,856, a much-needed support for our work to empower some of Delhi and Bihar's poorest and most marginalized women and their families. We are a grassroots, low-budget organization, and every rupee brings us closer to achieving personal, social, and economic empowerment for every Indian woman worker. To continue hearing about our work, do follow our Facebook page at https://www.facebook.com/SEWABharatOfficial/, or visit us at sewabharat.org. We regularly post stories of the women who benefit from our work and our SSKs and are always happy to hear from you. Thank you so much to everyone who has donated to our campaign! This is SEWA's first large-scale crowdfunding effort; we had no idea what to expect when we began this journey, and have been surprised and excited to find so much support from people all over the world. We are incredibly grateful for all of your donations and kind words. We've begun initial discussions and planning for expenditure of this money, and hope to put the majority of the funds (besides a small portion to immediate organization development and administrative costs) raised so far towards registration as an Aadhaar card authority. This change will significantly reduce our Aadhaar processing costs as well as increase our Aadhaar processing speed, enabling us to provide better service to more women in need across Delhi and Bihar. And our campaign isn't over yet! In these last weeks, we would greatly appreciate your continuing to share our campaign link with anyone you think would be interested in supporting our work in Delhi and Bihar with women in the informal economy. For more information about our SSKs, please visit http://sewabharat.org/program-themes/health-social-security/.